There are some films where the very existence of them and the fact that they are even being released at all is cause for celebration, and the concert documentary Amazing Grace is one of those films. 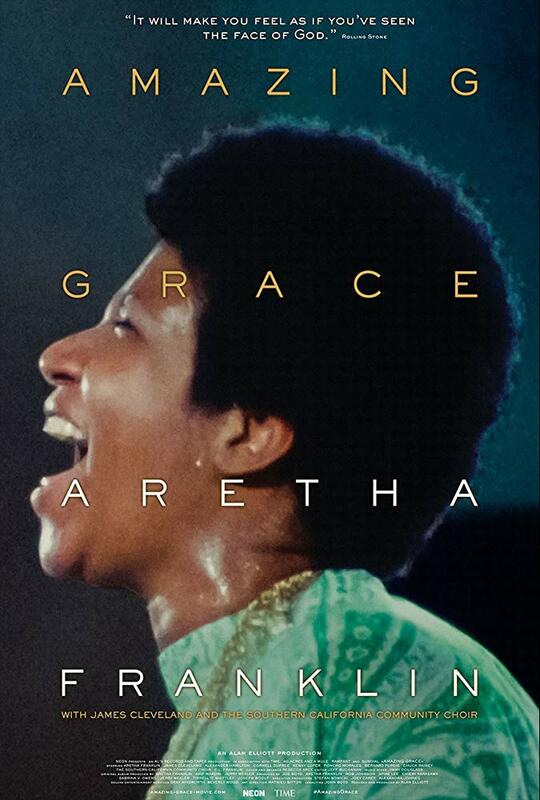 Shot over two nights in January of 1972, the film documents the taping of Aretha Franklin’s bestselling gospel album Amazing Grace, which was recorded in front of a live audience at the New Temple Missionary Baptist Church in Watts, Los Angeles, with singers from the Southern California Community Choir backing her up, and the Reverend James Cleveland acting as emcee. Made under the guidance of the late director Sydney Pollack, who was hired by the team at Warner Bros. to oversee the shoot, the film offers a compelling encapsulation of the two concerts, and it allows us to see Franklin at the height of her prowess and witness her faith in Jesus Christ. As she powers through her now famous arrangements of gospel songs like “Mary, Don’t You Weep,” “What a Friend We Have in Jesus,” “You’ll Never Walk Alone” and of course her haunting, elongated version of the titular track “Amazing Grace,” we get to witness the euphoric reactions of the audience, a mix of parish parishioners and fans of the singer including Mick Jagger and Charlie Watts of the Rolling Stones, who respond with adulation at the sound of her voice and her praise of the Lord. The film has sat dormant for over forty years, and is only being released now, following the death of its subject in August of last year. One of the reasons for this delay is because the production team failed to use clapboards during the shoot, so the sound was never able to be properly synchronized with the footage until advances in digital technology made the process much easier. The other reason is because Franklin herself didn’t want the film released for various reasons. There were unresolved legal issues between Franklin and producer Alan Elliott, which led to her obtaining a court injunction to prevent the film from being screened at Telluride and TIFF back in 2015, where it was scheduled to premiere after finally being completed. But after watching the film, it’s a bit hard to imagine why she wouldn’t have wanted it seen. While Amazing Grace finally being released, with the blessing of Franklin’s niece and executor of her estate Sabrina Owens, is worth celebrating on its own, the fact that the footage still holds so well just makes it even more miraculous. This is a wonderful snapshot of Aretha Franklin at the height of her career, showing the power that she was able have over an audience. We get to witness how she was able to enrapture the gathered crowds with her voice, while singing to the heavens in praise of God at the same time. There is no replacement for what those lucky people who got to be there would have actually felt in that church over those two nights, but watching Amazing Grace is the closest we will ever get to that feeling, and that’s more than enough. Amazing Grace is now playing in limited release at Cineplex Cinemas Varsity in Toronto.